I don’t usually venture so far outside the topics of food and general musings. But when I find something worth sharing, I just can’t keep it to myself, especially when its a technology that I know can benefit most people. I wasn’t always this way. Almost six years ago, I started dating a complete technology geek and somehow over the course of time, he has converted me into a fellow geek. While he’s the expert in all things complex that I can’t begin to understand (I swear sometimes it’s like he’s talking Klingon), we both share a love of technology conveniences. We may drive old cars, but by God, if we can buy some sort of technology that will make our lives easier, it’s a no brainer. That’s why I call our house the shrine to Apple. Because of Brad’s love and career in technology, I know a lot of pretty brilliant people (Brad included). They’re never short of million dollar ideas, but only every once in a while do I actually know what they’re talking about. What I want to share with you came from one of these good friends. I’ve been using the product of his idea for a while and it’s completely changed my behavior when I reach for my credit card. And it’s saved me money. It’s Reward Summit and it’s not only helpful, it’s downright necessary if you have more than one reward credit card. I have two. In my opinion, there is no reason to have a plain old credit card, when there are plenty of reward cards out there who will give you free money just for using their cards. Free money is my favorite thing next to puppies and ice cream. But to be honest, how many of us know which reward credit card is best to use in what situation? I have had a Bank of American Rewards Card for a really long time and a Discover Rewards Card for about three years. Every month they have 1% back on this and double points earned on that. Frankly, I’m too busy to keep up with these constantly changing promotional details. So Reward Summit has been doing that for me. When I first downloaded the app, I told it which credit cards I have (I didn’t have to enter my actual credit card number). And it already knew the specifics of my cards. When I go into a store, I just tell the app where I’m at and it tells me which card will get me the most money back for my purchase. I enter the amount spent after the cashier tells me what I owe and it will not only tell me what card to use but exactly how much money I’m being rewarded from the purchase. I usually do this during the five seconds it takes to approve my credit card transaction. So what do I do if I’m shopping online? There’s a place for online purchase in the app as well. 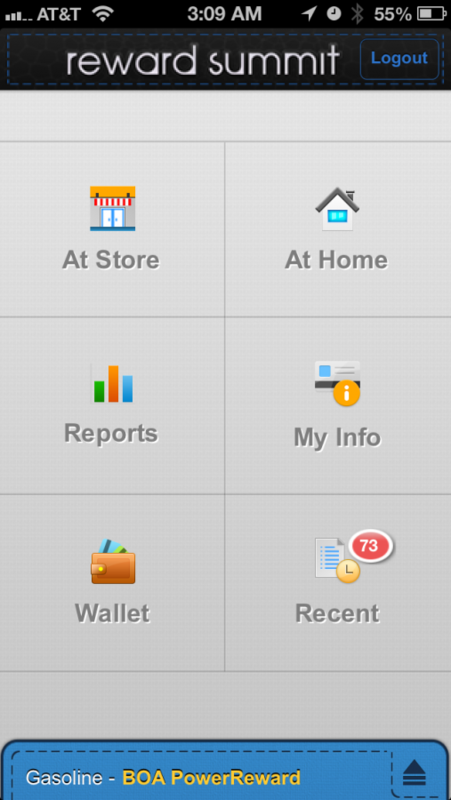 I just tell the app I’m shopping at home and choose the type of purchase I’m making (merchandise, automobile, hotel, etc.) and it works the exact same way as an in-store purchase from that point. This app has completely changed the way I pay for things. I’m one of those people who put every single thing on a credit card if I can. I pay my balance off every month and in return I reap lots of rewards. I thought I was pretty smart. 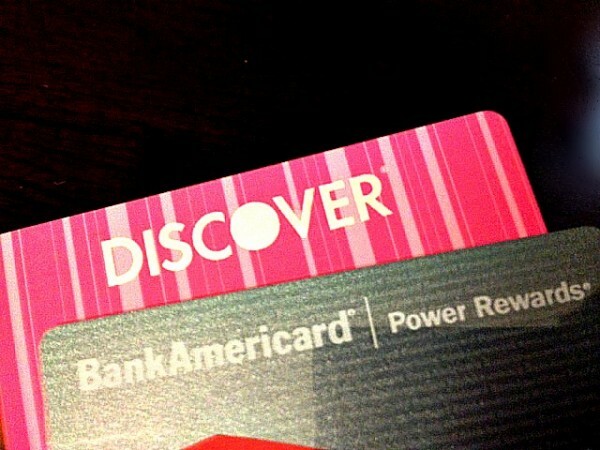 In the past, I almost always used my Discover Card. My Discover Card is a gas rewards card. I got it back when I was driving over two hours in my daily commute for work and even though I don’t fill up nearly as much as I used to, I just assumed it was the better card. I was so wrong. 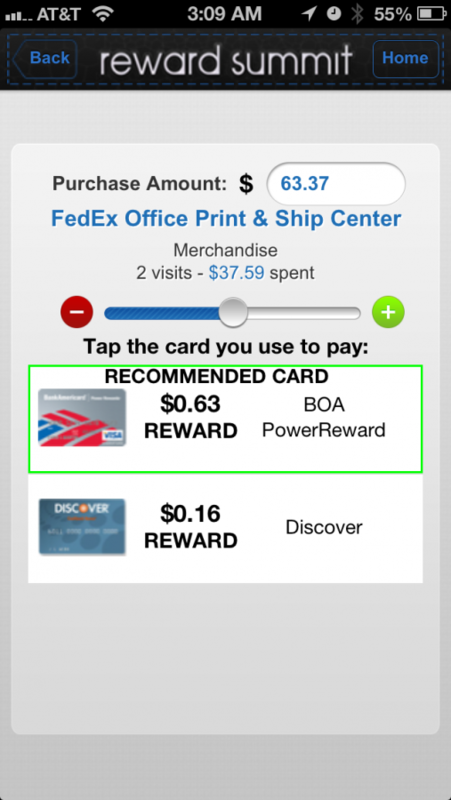 Reward Summit has taught me that my Bank of American Card is almost always the better option except in certain situations like gas and when Discover is running a promotion. I can’t even begin to imagine the monetary rewards I could have earned the past three years had I been reaching for my BofA Card rather than my pretty pink Discover card (smacks forehead). You can also use it in conjunction with Four Square. 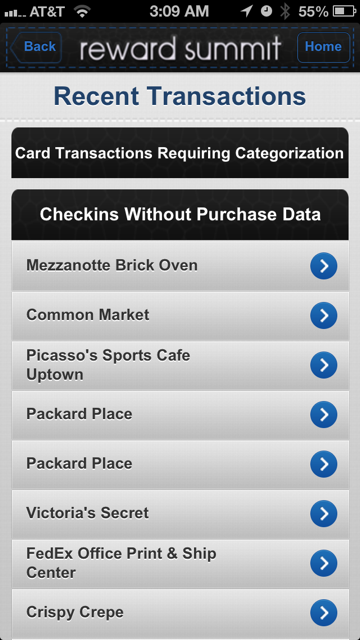 I really like this feature, because when I check into Four Square, a little window pops up on my phone and tells me which card to use and if I forget to use the app at the checkout, it saves my check-ins so I can go back later to use the app. It’s important to tell the app how much you spent if you want to get the best use out of the app. 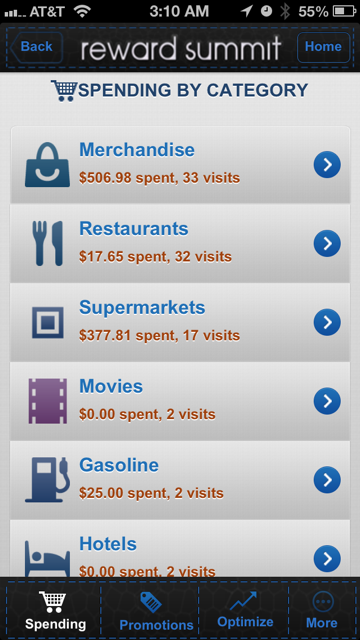 There is a reports feature which will tell you exactly how much you have spent and how much you have saved in each of the spending categories. It really helps you see the bigger picture beyond each single purchase. But the very best part about this app is that it’s completely free. I can’t think of one good reason why you shouldn’t download it unless you just really like to throw money away. In fact, I’m going to have to talk to them about changing the app’s name to Free Money. Reward Summit is currently available for the iPhone and iPad but an Android version is currently in the works and will be released in a couple of weeks. You can download it here for your iPhone or iPad. If you have any questions about the app, I’m happy to answer them via comments, email, Twitter, Facebook. You know how to reach me.